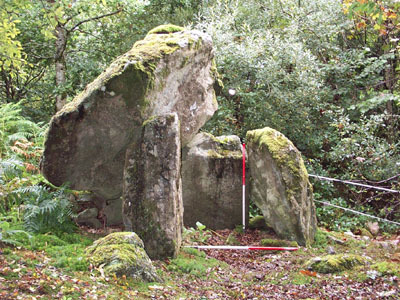 This project is part of a pan-Wales initiative to identify and protect the prehistoric monuments of Wales and to conserve them for the enjoyment and knowledge of future generations. There are over 2500 known examples of prehistoric funerary and ritual sites in Dyfed alone, and it is expected that over the course of the next 5 years, Dyfed Archaeological Trust will visit as many of these as possible, recording their current condition, taking photographs and making management recommendations, helping to keep the Historic Environment Record held at the Dyfed Archaeological Trust offices in Llandeilo fully up to date. 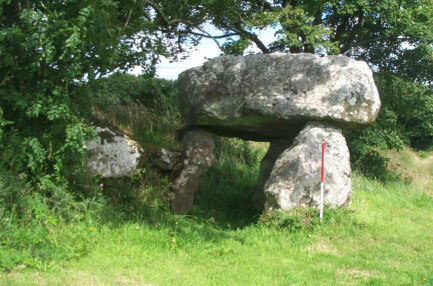 During the first year of the Prehistoric Funerary and Ritual Sites (PFRS) project Dyfed Archaeological Trust undertook a rapid assessment of the form and condition of all known Neolithic and Bronze age funerary and ritual sites from the area of west Carmarthenshire as extracted from the regional Historic Environment Record. During the fieldwork, a further 23 new sites were identified and added to the HER. The vast majority of these were round barrows. A number of new hierarchical records were also created including 6 prehistoric monument complexes, 10 round barrow cemeteries and 13 round barrow cemetery (pair) groupings. This latter class was identified from fieldwork as potentially a distinct monument form in its own right, possibly a phenomenon peculiar to the Dyfed region, but suspected to exist elsewhere within Wales. West Carmarthenshire is a rich and varied landscape, incorporating part of the coast, the Taf, Tywi and Gwendraeth estuaries as well as inland upland areas, characterised by rolling hills and numerous valleys. Within this area there are a number of well-known monument complexes, including those of Glandy Cross in the west of the study area and Mynydd Llangendeirne in the southeast. Both of these complexes contain a large number of different prehistoric funerary and ritual monument types. In a landscape that is intensively farmed, it was not surprising that the results demonstrated that the condition of a number of sites, particularly earthen mounds, had deteriorated since they were last visited. For many sites, it had been at least fifteen years since they were last assessed and recorded. In that time some had been eradicated altogether, usually as the result of regular ploughing. Some standing stones and other monuments had been moved or destroyed as a result of land improvement measures, whilst other monuments, already severely eroded, may not last another generation of farming activity. However, a good proportion of sites remained unchanged and in a stable condition and are expected to remain so for the foreseeable future, thanks to their sympathetic landowners. The distribution and topographical siting of all the monuments in west Carmarthenshire, and with round barrows and standing stones in particular, showed that the locations of these monuments were very carefully chosen, and for a variety of reasons. Many of these monuments were sited in prominent positions: not only with commanding views out over the rest of the landscape, but the sites (or their locations) could equally be seen from other points in the landscape. There was also a clear indication that there was a relationship with the location of other similar Neolithic and/or Bronze Age monuments. Work during the second year of the project focused on east Carmarthenshire. The initial HER search included all sites positively identified as belonging to relevant monument classes (i.e. chambered tombs, round barrows, standing stones, etc.). It also included a number of uncertain sites or sites which have alternative possible interpretations (e.g. clearance cairn/round barrow). Sites identified only by place-name evidence or from documentary and other sources were also incorporated. From this initial enquiry, 751 sites have been identified for the area. All have been assessed on the basis of the information held on the computerised database in conjunction with a variety of other paper records held within the HER. Of these, it is intended to visit 536 sites. This figure excludes place-name sites, destroyed sites, findspots and sites only known from documentary sources. Two groups of site types, which together form a large part of the database, require further field evaluation. These are sites listed within the HER under 'cairn' (73 sites) and 'scoop grave' (70 sites). Very little information exists about the character of these sites. Within the record, the term 'cairn' often fails to distinguish between sepulchral or agricultural sites and there is often no accompanying description within the HER database. 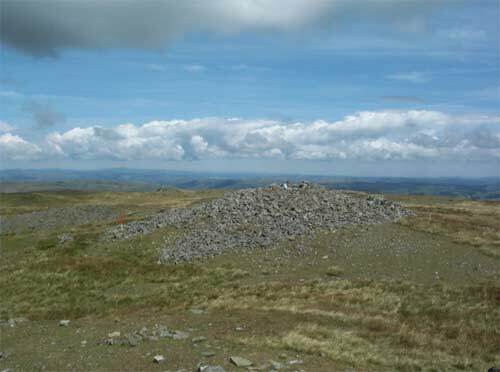 Many of these 'cairn' sites were identified during projects undertaken within a closely defined geographical area on the Black Mountain. More information exists on the HER about the 'scoop graves' with each having a short description. However, the precise nature of these features has not been proven. Once again, this group shares a particular geographical location (Mynydd Mallaen) and were identified as a result of a survey of the area in 1995. It is hoped that a rapid assessment of both the 'cairns' and the 'scoop graves' may result in a large number being discounted or at least that their geographical concentration will allow for them to be visited reasonably quickly. The foot and mouth crisis has delayed the start of the fieldwork in east Carmarthenshire. As a result, and with the agreement of Cadw, work has begun on the desk-based work for Pembrokeshire. The initial HER enquiry highlighted a total of 1210 potential sites. However, this figure included 342 findspots. 'Finds' were initially included to give an indication of the types of artefacts that have been recovered from the area and to make a comparison between the distribution of material culture and Neolithic and Bronze Age funerary and ritual monuments. These findspots will not be visited unless it is suspected that they might indicate the remains of a potential monument. A further 215 sites were recorded from place-name evidence alone, 65 from documentary sources alone, 4 sites were recorded as buried features, 3 sites as landforms and 67 sites are known to have been destroyed. This leaves total of 514 sites to be visited during the fieldwork phase of the project. The area of east Carmartheshire is dominated by two massive upland blocks, the southern edge of the Cambrian Mountains (including Mynydd Mallaen) and the western end of the Brecon Beacons (including Mynydd y Betws and Mynydd Du). The vast majority of the known monuments are located on the gently undulating plateux areas. Prior to the survey a total of 751 records were assessed. A decision was made not to make routine visits to sites known only from documentary or place name evidence or as findspots or to sites described on the record as clearance cairns or cairnfields. Similarly, sites described as ‘scoop graves’ were not routinely visited because of the uncertainty that remains over their character. During the course of the survey a number of new sites were identified. 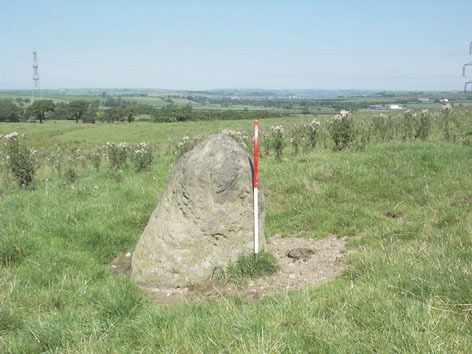 Conversely, several of the sites that were targeted for site visits were subsequently reclassified as non-prehistoric monuments. The revised figures for east Carmarthenshire now include a total of 235 definite and 175 possible individual sites. A total of 64 of these sites are currently scheduled. Many of these sites also form part of monument groups such as barrow cemeteries. A total of 39 definite and 9 possible monument groups were identified. The largest group of individual sites was Round Barrows with 292 definite or possible sites followed by Standing Stones with 74 definite or possible sites. An assessment was made of the condition of all the sites visited as well as their topographic setting. The distribution of sites shows a marked concentration with the upland areas although this was less marked for some monument types (eg Standing Stones) than others (eg Round Barrows). Some variation was also observed in the topographic location of different monument classes (eg between summits and hillslopes). It seems likely that the visibility from and to sites was a key factor in the determination of site location. From some sites, especially those in hilltop locations, it was frequently possible to see many other monuments and to have extensive views across the landscape. A complementary study of the topographic location of sites within the Upper Twyi Valley was undertaken by a research student at the University of Birmingham. This research also examined other aspects of site location through computer based GIS analysis. The results of this study demonstrate the potential value-added benefit a GIS based analysis could bring to the Prehistoric Funerary and Ritual Project. Following the completion of the project report for east Carmarthenshire a start was made on the field survey of Prehistoric Funerary and Ritual Sites in Pembrokeshire. Over a 100 sites were visited in the south of county during the later part of the financial year. The results of this survey will be integrated with the work due to be undertaken in 2003/2004 in the north Pembrokeshire/Preseli area. During the Pembrokeshire phase of the project a total of 941 records on the Regional HER were examined. Of these, 178 were of scheduled sites (SAMs). They also included sites suggested by place-name evidence and documentary sources but excluded the locations of prehistoric findspots. The 'place-name' and 'documentary' sites (259) were not routinely visited and neither were sites recorded as destroyed or removed. A number of other sites could not be accessed during the field survey. A total of 596 sites were visited/recorded during the field stage of the project. Of these 538 were considered to be the sites of prehistoric funerary and ritual activity including 500 individual sites and 38 group monument types. Some damage to existing SAMs, particularly by forestry operations and visitor disturbance, is giving some cause for concern. Meanwhile, other sites that do not have SAM status, are being gradually eroded or destroyed by modern farming methods. The patterns noted in previous years of the project are largely the same for Pembrokeshire (e.g. in terms of preservation, location, association, etc.). 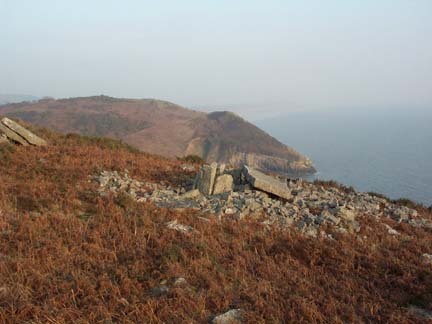 However, there are a noticeably larger number of chambered tombs in Pembrokeshire than Carmarthenshire, as well as a seemingly more clustering of sites to form complexes or cemeteries. The project in Ceredigion began in the southern half of the county. A total of 305 prehistoric funerary and ritual monuments were visited including 8 newly discovered sites. The general distribution trends for southern Ceredigion are much the same as those seen in Carmarthenshire and Pembrokeshire. Round barrows, prehistoric monument complexes and round barrow cemeteries mostly favour locations on land 250m or over. However, there are significantly fewer chambered tombs and standing stones in Ceredigion compared to Pembrokeshire. 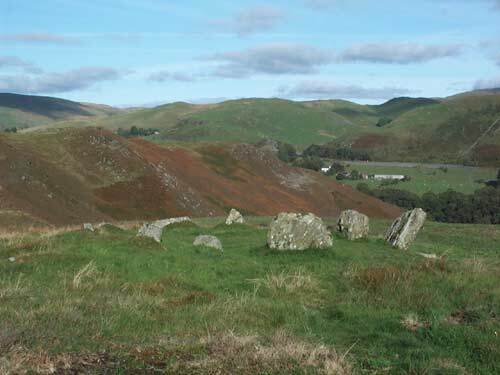 From May 2004 to December 2005 field visits were made to all relevant prehistoric funerary and ritual monuments within Ceredigion, and a full report for the county as a whole produced in April 2006. Of the 862 sites originally extracted from the HER, 425 sites were initially targeted as requiring field visits, although a total of 495 sites were actually visited during the fieldwork phase of the project. 67 new records were created, of which 36 were group PRNs (e.g. prehistoric monument complexes, round barrow pairs etc.) and 31 were individual, newly-discovered sites. A total of 105 scheduling recommendations were submitted to Cadw in a separate report. 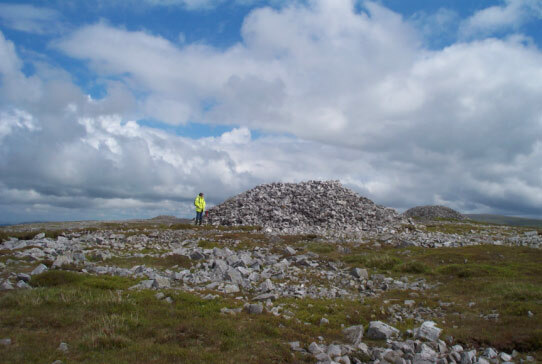 One of the most striking patterns to emerge from fieldwork was the considerable visitor disturbance caused to a number of the round barrow cairns in some of the more remote upland locations around Pumlumon, and surrounding peaks. These are very popular with walkers and are often sited close to footpaths, providing landmarks on journeys across the uplands. A full discussion of this issue was included in the final report for Ceredigion that was submitted to Cadw. An Action Plan summarising the results of the work undertaken during the PFRS project in the last 6 years has been recently completed. This lists key sites and landscapes within the southwest Wales region, identifying particular monuments perceived to be at risk, and suggesting future initiatives for the PFRS project. Over 1850 sites were visited by the Trust in southwest Wales following an assessment of over 3500 individual records. Approximately 300 new entries have been added to the HER, and over 260 scheduling recommendations have been made as a result of the survey. During 2006-07, data collected during the course of the fieldwork was archived and deposited with the National Monuments Record. A report on the results of the Ceredigion survey was produced; this will be published in the journal Ceredigion in the near future, and the text of trail booklet guide to sites on Carningli Common, Pembrokeshire was produced. This guide will be printed in the near furture. Two trail guide booklets have been produced aimed at walkers in Pembrokeshire, one for Mynydd Carningli/Mynydd Melyn and one for Preseli. These can be downloaded as pdfs. Three geophysical surveys were undertaken during 2008-09: Moel y Llyn Stone Circle; Pant y Butler Round Barrows; and Crugiau Cemmais round barrow cemetery.